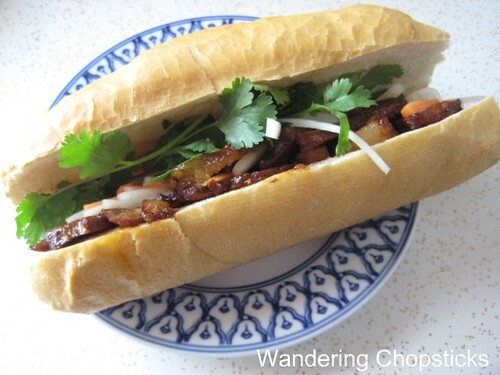 So now that you've got my recipe for Char Siu/Xa Xiu (Chinese/Vietnamese Barbecued Pork), it's simple enough to put together a recipe for banh mi xa xiu (Vietnamese barbecued pork sandwich). Again, this is more an assembly list of instructions than a recipe. Assemble all the ingredients, except pickles, cucumbers, and cilantro. Put in the toaster oven for about 5 minutes. Add in greens and pickles. So yummy that this works even on ciabatta-ish no-knead bread and grated carrots with a light rice vinegar vinaigrette. 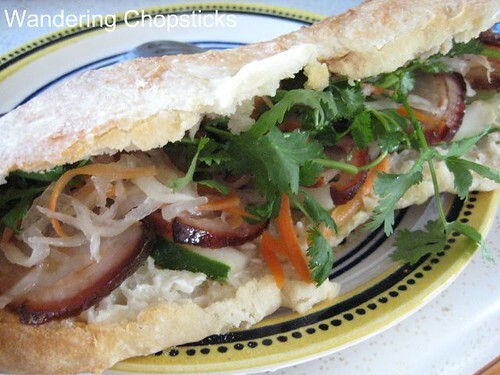 oh i adore banh mi. even with my braces, i still attempt at eating it. one of these days i'm going to break a bracket and my orthodontist will only see bread crumbs. Thanks so much for your lovely thoughts on my blog! oh geez,I have Banh Mi at least 4 days a week in the morning for breakfast, if not its a breakfast burrito. You know, I used your Xiu mai recipe at least twice a month which turns out to be my breakfast. I ate so much junk when I had braces. My orthodontist had to glue brackets back all the time. Never? That's another VNese dish you'll have to try then. Really? I thought there was quite a sizeable VNese population in Vancouver. 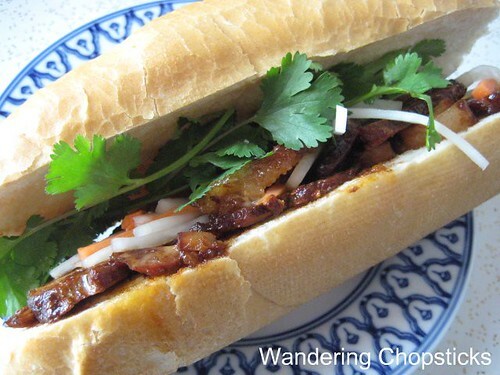 Maybe you just haven't found a good banh mi shop yet? Awesome. How 'bout a xiu mai burrito? Haha. Wow...this ba'nh mi` looks so good. I can't wait to make this xa xiu recipe. I am planning to make some ba'nh mi`xa xiu and bring them to the beach :-) Thanks again for posting this recipe. May I ask... how do these taste without the pate? I'm shying away from it because it seems so terribly fatty. I've had a couple of different Lee's sandwiches, but that is all I have for comparison. I'd really like to make these at home, but do you think I will miss the pate?